Indulge in too much sweet mooncakes can be real cloying :) Let's try out some savoury sweet mooncakes for a change! This is a traditional Teochew style baked mooncakes which consist of pork floss, sweet miu choy, candied mandarin orange, candied melon and sesame seeds. Interesting combination isn't it? 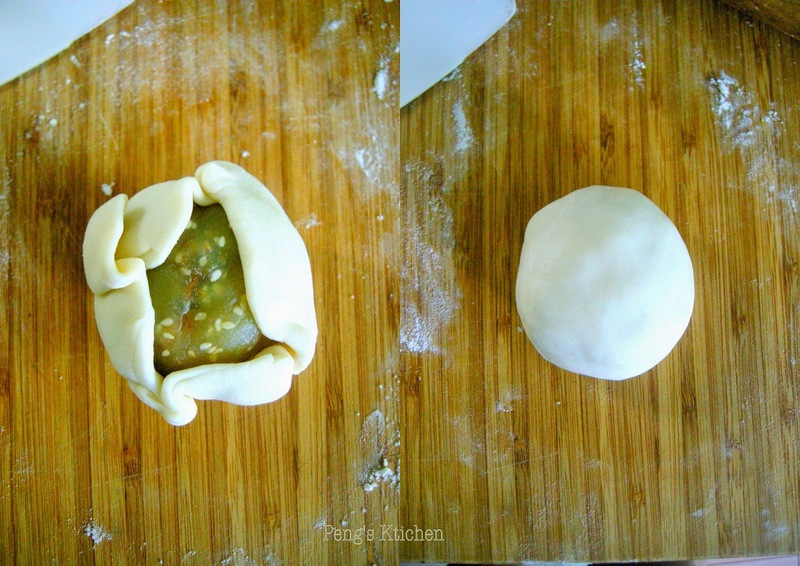 With seam sides down, flatten the pastry into a round disc. 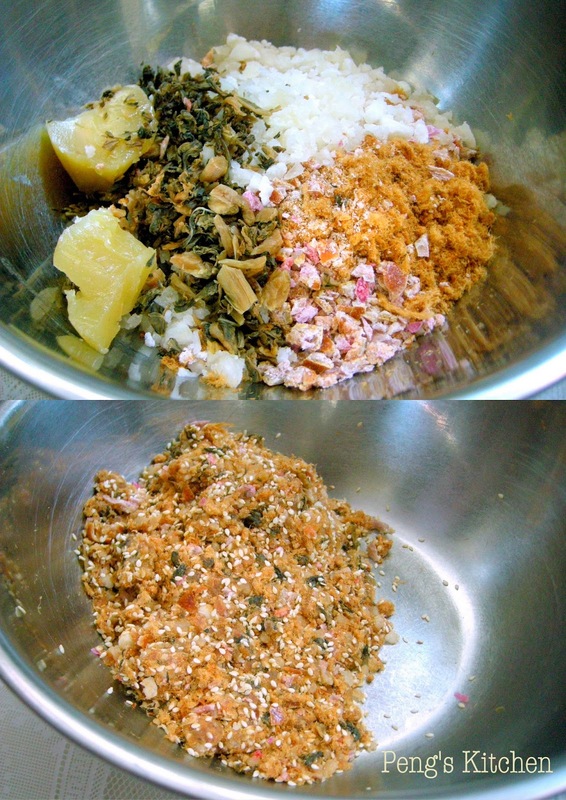 Egg wash and sprinkle white sesame seeds over. Rinsed preserved mii choy thoroughly and soak in water for 10mins. Squeeze away water and finely chop. Fry in a dry and oiless pan till fragrant and dry. Remove. Using the same pan, fry the sesame seeds until fragrant and lightly browned. Finely chop candied melon and mandarin orange. 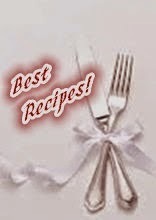 Combine 50gm lotus paste with the meat fillings into a mixing bowl and mix thoroughly till well incorporated. Divide into 10 equal portions. Divide the balanced lotus paste into 10 x 40gm portions. 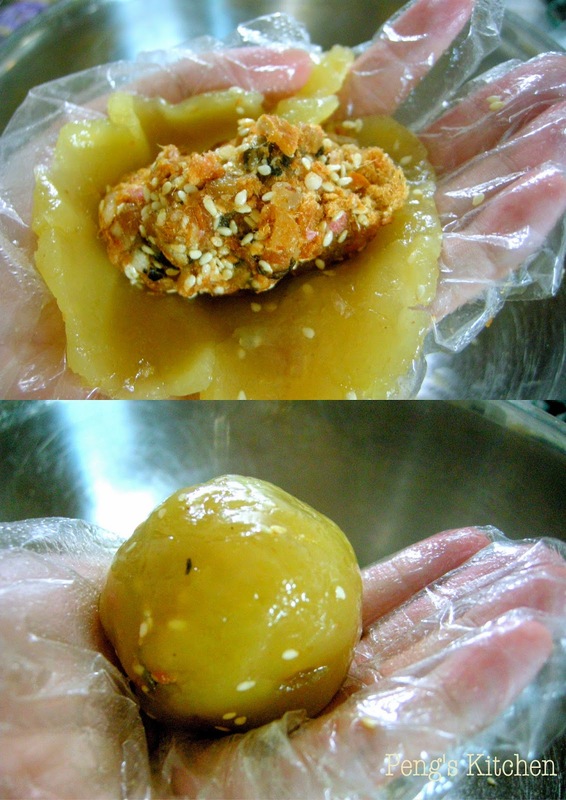 Wrap up with the filling and clenched firmly into a ball. 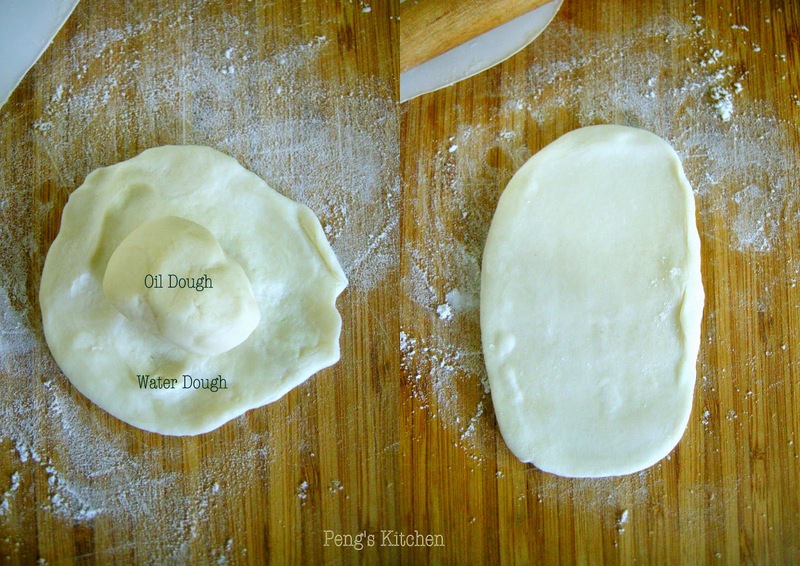 Water Dough : Cut shortening into plain flour and gradually add in water and knead till a soft and non sticky dough is formed. Cover and rest for 30 mins. Divide into 10 equal portions. 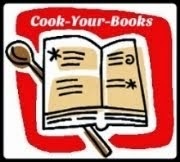 Oil Dough : Cut shortening into flour and mix till crumbs liked. Lightly knead till it comes together into a soft dough. Cover and rest for 30 mins. Divide into 10 equal portions. 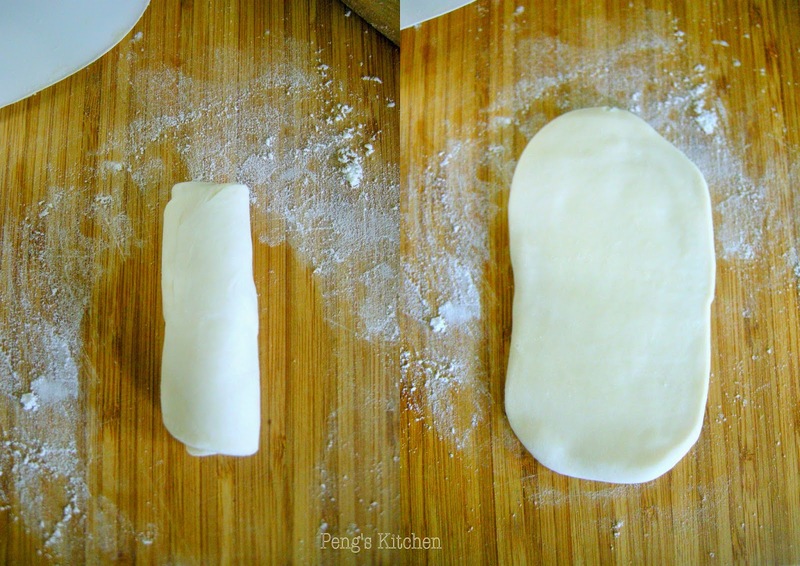 Wrap oil dough with water dough and roll out. Roll up into a log shape. Flatten slightly and roll out into a rectangle. Make 3 folds and roll out into a flat disc. Wrap in a portion of the filling and seal the edge tightly, removing any excess at the end. 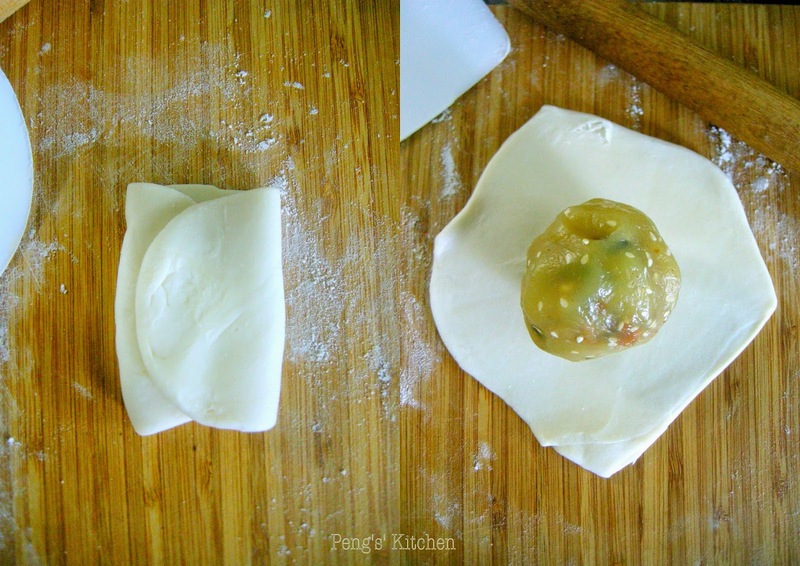 With seam sides facing down, flatten the pastry into a round even disc. Place it on a lined baking sheet. Prick the surface with a fork, egg wash and sprinkle sesame seeds over. Repeat with process with the remaining dough and filling. Bake in preheated oven at 180 deg cel for 20 mins. Remove from oven and rest for 10 mins. Egg wash again and bake for another 12-15 mins until golden brown. Cool completely on wire rack before storing. 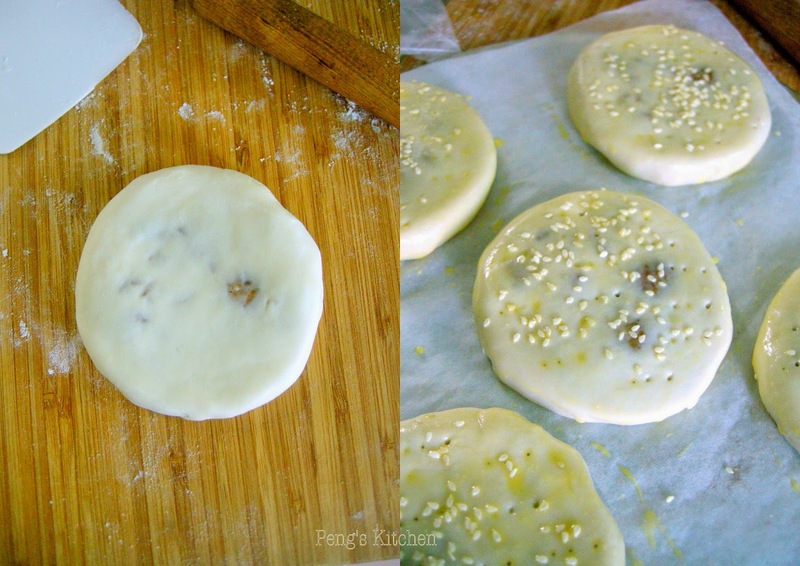 This post is linked to the event, Best Recipes for Everyone August 2014 Event Theme: Mooncake hosted by Fion XuanHom's Mom. Really interesting ingredient with the mui choy! Looks really good!